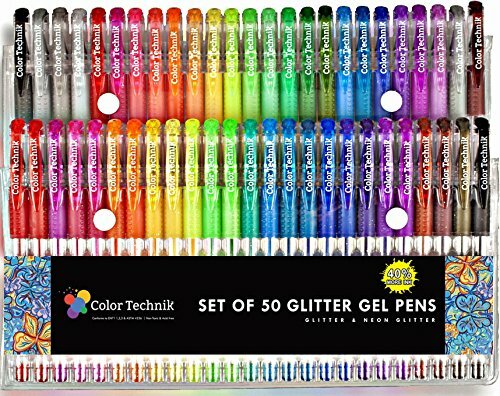 Glitter Gel Pens by Color Technik, Set of 50 Individual Colors, 40% More Ink. Largest Non-Toxic Artist Quality Glitter Set By Color Technik, Perfect For Adult Coloring Books Etc. Great Gift Idea! ★What Can I Do With Them? Many Uses Such as Arts & Crafts, Scrap Books, School Projects, Party Invites, Greeting Cards, DIY Decor, Doodle And Letters to Friends And Family, The Uses Are Endless! ★What Separates Color Technik Gel Pens From The Competition? Resulting in Our Color Technik Gel Pens, Which Are a Perfect Combination Between Quality And Value. Strong Durable Tips, Fast Drying Ink And Have a Smooth Ink Flow For Smoother Writing And Drawing Producing Perfect Lines With Every Use! Try Our Color Technik Gel Pens For 30 Days, if During That Time You Don't Love Them or Don't Feel They Are Worth Every Penny of Your Investment Today! We'll Give You Your Full Money Back No Questions Asked! Your Protected By This Guarantee Whether You Used One or All! That's How Confident We Are You'll Be Happy And Keep Coming Back For More! DON'T MISS OUT, LIMITED STOCK! ★SALE PRICE MUST END SOON! CLICK ADD TO CART ABOVE! ★ PREMIUM ARTIST QUALITY: Gift Set of 50 Unique Amazing Vibrant Glitter & Glitter Neon Colors. Micron Archival Quality Style Ink. ★ WE ARE LISTENING: We appreciate all your feedback, You Wanted More Glitter Colors to bring your pages to Life, So We Have Put Together The 50 Pack with All Your Favourite Colors to Fulfill all your Artistic needs. ★ COLOR TECHNIK GEL PENS: Will Make Your Pictures Sparkle & Shine, Have a Smooth Ink Flow For Smoother Coloring & Writing. Strong Durable Lead-Free Tips that produce perfect lines, Tip size 1.0mm ★ COMFORT GRIP: Color and Doodle away the stress of the day with ease, each pen is fitted with Color coded comfort grip. ★ VARIETY OF USES: Premium Quality Gel Pens are Great for a Variety of Uses Such as Arts & Crafts, Adult and Children Coloring Books, Scrapbooks, School Projects, Party Invites, Greeting Cards, Doodle, DIY Decor & Letters to Friends & Family, The Uses are Endless! ★ SAFETY FIRST: CONFORMS TO ASTM D-4236 & EN71-3, Acid-Free, Non-Toxic, Lead-Free ★ GUARANTEE: Buy Now Risk-Free, Limited SALE OFFER, You are Backed by our 365 Days Money Back Guarantee! If you have any questions about this product by Color Technik, contact us by completing and submitting the form below. If you are looking for a specif part number, please include it with your message.